Department of Biotechnology, Mandalay Technological University, Mandalay, Myanmar. *To whom correspondence should be addressed. E-mail: monmon@mtu.edu.mm. Received 09 July, 2018; Received in revised form 03 August, 2018; Accepted 06 August, 2018. Boscia variabilis, Seasonal vegetables, Phytoconstituents. People in rural areas of Myanmar often use wild plants as seasonal vegetables. The present study was focused on the analysis of phytoconstituents of the edible wild plant, Boscia variabilis Coll. & Hemsl. 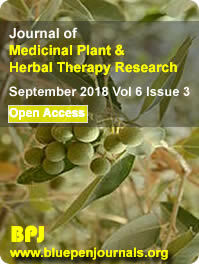 The phytochemical analysis of edible parts of this plant showed the various amount of major bioactive constituents such as flavonoids (26.72 mg/g), alkaloids (14.6 mg/g), tannins (24.9 mg/g), total phenols (31.75 mg/g) and saponins (26.5 mg/g). The studied plant is also rich in mineral elements; potassium (K) (18.466 mg/g), calcium (Ca) (1.691mg/g), magnesium (Mg) (0.96 mg/g), sodium (Na) (0.185 mg/g), iron (Fe) (0.006 mg/g), zinc (Zn) (0.003 mg/g) and cromium (Cr) (0.0004 mg/g). Analysis of vitamin constituents showed the presence of thiamin (0.004 mg/g), riboflavin (0.007mg/g) and niacin (0.026 mg/g) but ascorbic acid content was not detected. Futher investigations should be carried out to find out its biological activities.